You’re standing on a platform made of glass. The rim of the Grand Canyon is 70 feet behind you. The other side of it is 3 miles in front of you. Then you dare to look down and see ………… nothing – nothing but 2,000 feet of air between you and the bottom of the Grand Canyon. Until recently, a sensation like this could only be experienced in dreams. But now, on the Hualapai Indian Reservation that is just East of Las Vegas, dreams and reality will meld into one with the Grand Canyon Skywalk. 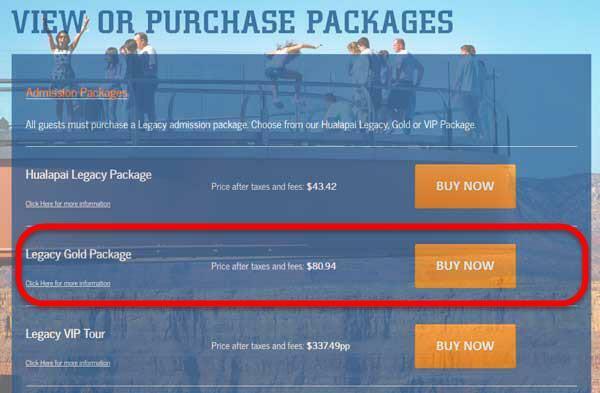 The Legacy Gold Package is the Ticket Price of $76.86 PLUS TAX per person for the Grand Canyon Skywalk. This has caused some confusion over time. You CANNOT just buy a Ticket to the Grand Canyon Skywalk ONLY. You MUST buy the Legacy Gold Package to enter the Skywalk -OR- it MUST be included in the Tour you book from Las Vegas. Located at Grand Canyon West on the Hualapai Indian Reservation, the new Grand Canyon Skywalk opened to the public on March 28th, 2007. The structure, consisting of a U-shaped cantilevered glass walk jutting 70 feet past the rim of the Grand Canyon, was dreamt up by Las Vegas businessman David Jin while taking part in a Grand Canyon tour in 1996. With the help of Las Vegas design firm Lochsa Engineering, Jin’s creation will be sturdy enough to hold the weight of a dozen fully loaded 747’s, and strong enough to withstand winds up to 100mph. Astronaut Buzz Aldrin lead the first walkers on the Grand Canyon Glass Skywalk in a private ceremony on March 20th, 2007. It is hoped that Grand Canyon West’s Skywalk Project will give an economic boost to the Hualapai Indian Tribe. Grand Canyon West, in development since 1988, offers Grand Canyon touring opportunities not available elsewhere, such as helicopter rides to the Colorado River, cowboy cookouts, horseback rides on the canyon rim and one-day Grand Canyon white water rafting trips. Grand Canyon West is located approximately 3 hours from Las Vegas, 6 hours from Phoenix or 4 to 5 hours from Grand Canyon’s South Rim. For complete driving directions to Grand Canyon Skywalk from Las Vegas – Click Here. Our most popular Las Vegas Grand Canyon Skywalk tour package: includes round-trip airplane flight from Boulder City to Grand Canyon West; an exciting helicopter flight to the bottom of the Grand Canyon for a smoothwater pontoon boat ride; ground tour of Grand Canyon West including a barbecue lunch on the canyon rim – and walk on the Grand Canyon Skywalk, too! A “pure helicopter” tour that’s pure excitement: experience ALL of your Grand Canyon flightseeing by helicopter! Fly from Boulder City to the bottom of the Grand Canyon for a relaxing pontoon boat cruise; back to the rimside to walk on the Grand Canyon Skywalk; Grand Canyon West ground tour, followed by return flight to Boulder City. Includes a light snack. All the fun of Grand Canyon West and the economy of a bus tour: relax and enjoy this day starting with a photo stop at Hoover Dam, and travel through the mystique of the Mojave Desert. At Grand Canyon West, a helicopter flight to the bottom of the canyon and a pontoon boat cruise await you; then walk on the Grand Canyon Skywalk! Includes lunch voucher.